Mission: Safety The CDPS Blog: DHSEM Recognized, Honored at Estes Park "Tribute Trail"
DHSEM Recognized, Honored at Estes Park "Tribute Trail"
pose next to the plaque honoring DHSEM. On June 15, 2017, the town of Estes Park commemorated the opening of its Tribute Trail. 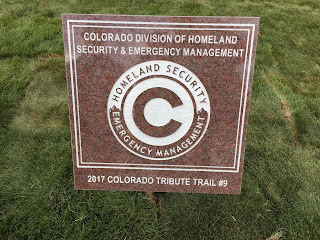 The Tribute Trail is a civic landmark that honors the service, bravery and courage of first responder agencies and their members who risk their lives unselfishly to help others in the State of Colorado. Inspired by the lifesaving actions of first responders during the devastating floods of 2013, the Tribute Trail features plaques honoring agencies and individuals who have rendered aid to the community. 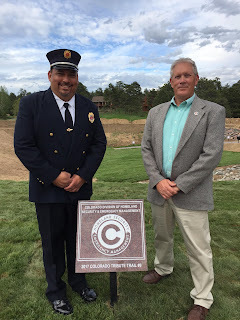 Each year, the Colorado State Fire Association will choose 20 first responder agencies or an individual within an agency to be honored with a plaque at the Tribute Trail. 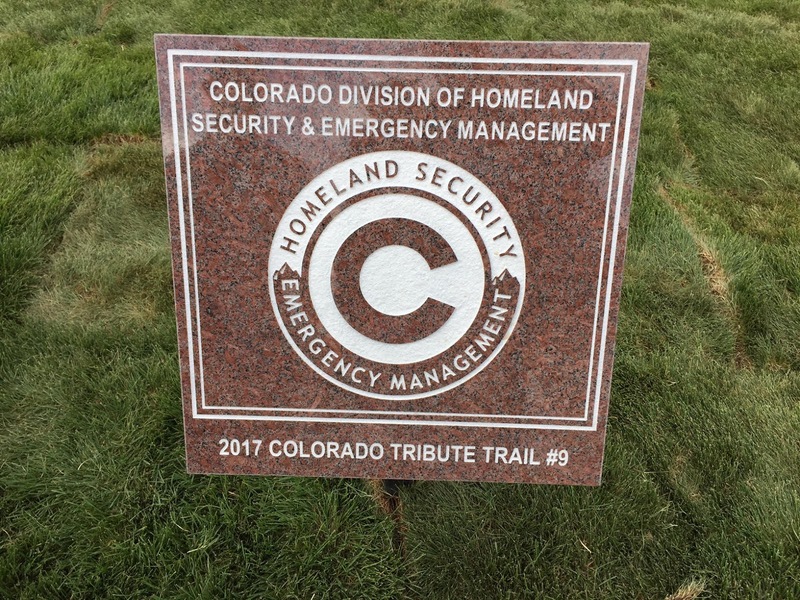 The Colorado Division of Homeland Security and Emergency Management (DHSEM) was among 20 inaugural inductees unveiled at the event on June 15. "I was humbled and honored to attend the Commencement Service where DHSEM was recognized and honored with an etched plaque at the launch of Tribute Trail," said DHSEM Northeast Regional Field Manager Kevin Kuretich. "It is a great honor for the Division to be permanently recognized at the Tribute Trail," DHSEM Director Kevin Klein said. A close-up look at the plaque honoring DHSEM. In 2013, Estes Park was devastated by unprecedented flooding. Cut off from the world, first responders provided a lifeline that saved the lives of thousands of families. Tribute Trail is a gathering point of first responders and visitors from across the US to celebrate and commemorate the heroic actions of first responders past, present, and future. Located in a stunning location donated by The Stanley Hotel, the Tribute Trail is a partnership with Colorado State Firefighters Association & Safeway to support the ongoing needs of first responders across Colorado.